Margins are tight in the metalworking business, so how do you get ahead? See how you can make more money with 5-axis by using our 5-Axis ROI worksheet. Don't get left behind. 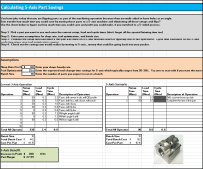 See how 5-axis can benefit your shop by downloading the ROI worksheet now. © 2019 Hurco Companies, Inc.